The days may be long past - buildings torn down, ways of life irretrievably altered, voices silenced. 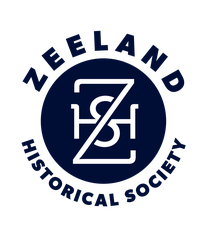 But history still speaks through photos, memorabilia and even a tree at the Dekker Huis/Zeeland Historical Museum as an anniversary is celebrated with new displays and a community gathering. The museum is marking its 40th anniversary on Thursday Aug. 18, with an ice cream social from 6 to 8 p.m. Extended hours are also being offered on that date from 10 a.m. until 8 p.m. so visitors can tour the museum and view a "Talking Tree" exhibit; seven new pictorial panels; an enlarged display area honoring the postal service and the local police and fire departments; and a nine-piece dining room suite. All activities are free of charge and take place at the museum, located on Main Avenue between State and Elm street. Sure to be heard and observed in the celebratory atmosphere is a 200-pound tree slice in the museum's entrance area that relates events from its 174-year lifespan. The massive white oak - which stood from 1840 through 2014 - speaks through a recording with some written text at the side, giving a new and fascinating twist to a history lesson. While the new tree exhibit utilizes the spoken word, history is recalled visually in the three-by-four-foot pictorial panels installed in the museum. Featured subjects in the panels include two for "Business & Industry" and one each for "Chix & Dux"' "Historic Homes"; "Hospitals"; "Traditions"; and "Transportation." Photos in "Transportation" chart the course of time from a "corduroy" road built of logs to horse-and-buggy days, the steam engine and the Interurban. "Traditions" features pairs of photos that leap from olden days to modern times. For example, a 1905 image of a young boy receiving his first bike is paired with a photograph showing a pack of competitors furiously pedaling in the Twilight Criterium. The "Chix & Dux" panel crows about Zeeland's former supremacy in the poultry industry, while "Historic Homes" showcases residences that have stories of many generations echoing within their walls. The two panels devoted to "Business & Industry" tell of Zeeland's first and only hotel; a maker of buggies and sleighs; a cheese company that became a giant in its field and is still well-known today; swampland turned into celery farms; and several other enterprises dating back to earlier eras. How a terrible tragedy resulted in the founding of the community's first hospital is a focal point in the panel devoted to that topic. The museum also will draw attention to a recent acquisition: a nine-piece dining room suite manufactured by Colonial Furniture of Zeeland. The furniture was donated by Mr. and Mrs. George Baron.